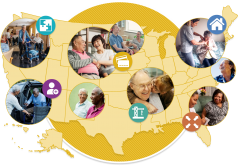 As the population ages, one of the greatest challenges facing state officials is how to organize and pay for long-term services and supports (LTSS) for low-income elderly and disabled adults—the most complex, expensive, and fastest-growing group covered by Medicaid. To help address this challenge, a toolkit for state leaders published in 2017 has been updated. Written by Manatt Health Strategies and the Center for Health Care Strategies, with support from the Milbank Memorial Fund and The SCAN Foundation, the toolkit describes a menu of promising strategies and best practices for states to advance person-centered, cost-effective LTSS options through their Medicaid programs. The 2019 toolkit picks up where the previous edition left off, providing updates to federal policy and state case studies based on new reforms and developments since December 2017. To make the information even more accessible to policymakers, the toolkit includes a brief for state legislators that highlights actionable strategies for Medicaid agencies developing LTSS reforms that improve the quality of care and help contain program costs. The brief gives a quick overview of recent LTSS reforms—and answers questions that state health care leaders have as they learn what states are doing to rebalance LTSS, encourage more home- and community-based services, and promote other integration strategies. There is also a summary of approaches outlined in the toolkit with an easy-to-read compilation of strategies, implementation mechanisms, and state case studies. The toolkit brings together comprehensive information states can use—and the updated edition ensures that it will be a resource for anyone developing state strategies for this important issue.